Due to the recent cold weather snap some of you may be feeling that your hair is drier than normal. We have two fantastic Kerastraight products with will help to combat these side effects. 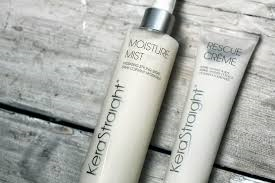 Moisture Mist is a hydrating spray that delivers lightweight moisture, it revitalises dry, tangled and chemically processed hair and is suitable for both straight or curly hair. Rescue cream is one of Jasons favourites as it is a treatment and a blow drying product in one! It is a light cream that seals split ends and leaves the hair soft, replenished and incredibly shiny.